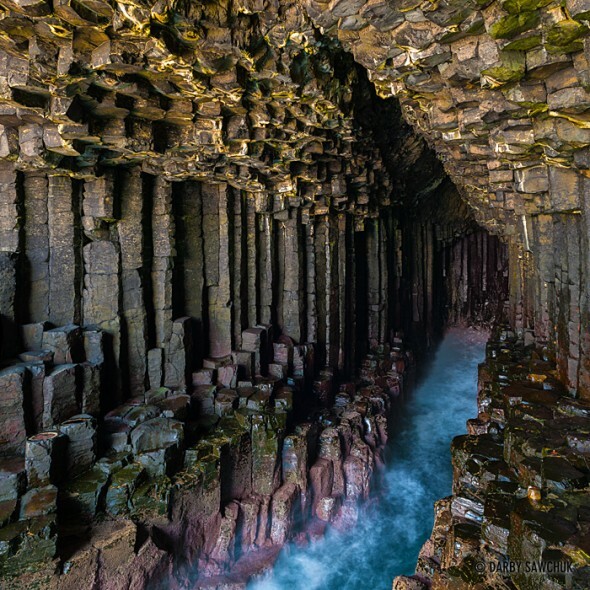 The jewel of the the uninhabited island of Staffa is Fingal’s Cave, a giant sea cave formed entirely from hexagonal basalt columns. The small island is west of the Isle of Mull and attracts visitors mainly for this natural wonder. Tempestuous waters jostled our boat while we attempted to moor, but expert guidance from our boat’s crew allowed all of us to safely hop onto the jetty so that we could make the short walk to the cave. The basalt columns formed by ancient volcanic eruptions serve as the pathway to the cave and you almost feel like you’re walking on a giant batch of french fries. Once we arrived at the main attraction, the high tides pushed waves into the cave where they thunderously crashed against the walls. That awesome roar from the waves was quite a show and easily made up for the choppy seas we faced getting on and off the boat.